Electric Motor is the common option to run the air compressor in engineering plant. This is the cheap alternative available comparing with other options such as diesel generator etc. The operating cost of an air compressor can be reduced by using an electric motor as a driving medium. This is true when your electric motor runs very smoothly. But think if your electric motor failed to start due to the burning of motor winding or failure of bearings etc. What will be the cost of repairing or replacement? This cost may be near about 33% of your Air Compressor cost. To keep Air Compressor running cost at a lower side, you have to protect your electric motor from failure. Most frequently motor failed due to an excessive current is drawn by the motor. To protect electric motor from excessive current and “Overload Protection Relay” is placed in the electric circuit. Excessive current may be due to either mechanical overload on the motor or due to an electrical system, due to unbalance supply voltage or single phasing or defective starter or defective in the motor itself. In either case, it is essential that the supply should be disconnected before any damage is done to the motor. An overload device thus usually operates by releasing the latching-in device by disconnecting the supply to no-volt coil or in contractor starters by operating the operating coil circuit. Electromagnetic overload relays are the old type which is not in use recent days that’s why I am giving details about Thermal Overload Relay. These are mostly used in Air Compressor nowadays. This may be bi-metal strips or solder pot elements and in either case, as the action is due to their heating up, a time element is always present. The action of bi-metal strips overload release depends on the movement resulting from the different rates of expansion of the two metals forming the combined strip when heated. The bi-metal strip may be directly heated by the current or indirectly heated by a coil of resistance wire which carries the current. 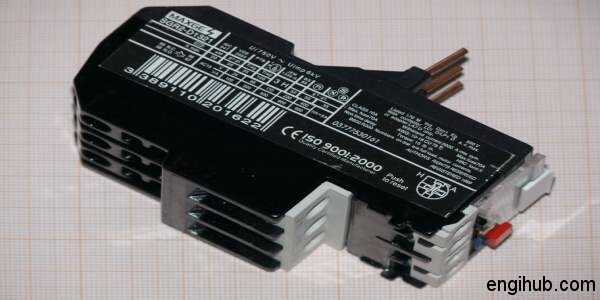 Thermal Overload relays are usually of the hand reset type, the reset feature is combined with the relay. For the closer protection of the motor, particularly against single phasing condition, the bimetal overload relay is connected to the phase circuit. Hence relay should be set for 0.6 times the actual line current drawn by the motor, as measured by an ammeter. 01) Start the motor with overload relay set at 0.6 times the rated motor current for star-delta starter and for rest of the starter at motor full load current stamped on the nameplate. 02) After the motor reaches the pick load condition, reduce the relay setting gradually till the relay trips. 03) Set the relay slightly higher than the tripping value. 04) To check the setting is correct or not, allow the relay to cool down, then restart the motor and make sure, the relay does not trip during starting. If trips, increase the relay setting slightly and check again. 05) To check the tripping, increase the unloading air pressure setting of air compressor by 1 kg/cm² from maximum rated air pressure, when the current increases than the normal peak load current, the relay should trip. (Allow air compressor to run for more than 5 minutes from peak pressure condition). If the relay doesn’t trip, slightly reduce the setting.